My elation after finishing off the new fence last night, followed by my realisation that my first mortgage was paid off a month ago, was somewhat dampened by the discovery that I’d washed my second weekly bus ticket in the space of a few days. This entry was posted in Disaster on 28/09/2016 by garymoore. My second in command has decided that it’s cold enough to have a fire. This entry was posted in Weather on 26/09/2016 by garymoore. Although I have holes to fill-in after new concrete has set, and old concrete to dispose of, we have a fence again. The fence needs painting and the garden looks like a battlefield, but cosmetic stuff can wait a few days. I do need to leave feedback for Wickes though. 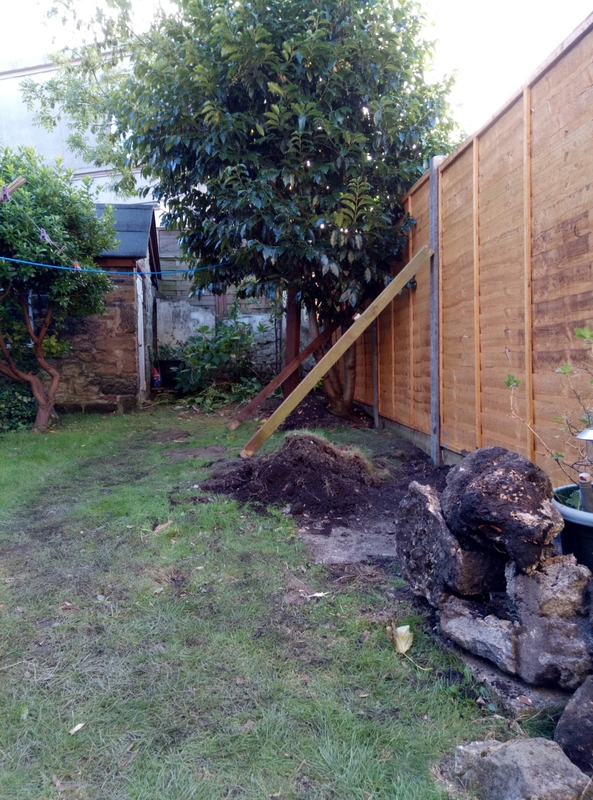 The fence posts are great, but the past feedback from builder types all says that two people are needed to move them. While it might not have been easy, one unfit office worker erected this fence alone. Well, my second in command may have mixed and carried concrete after a day at work. 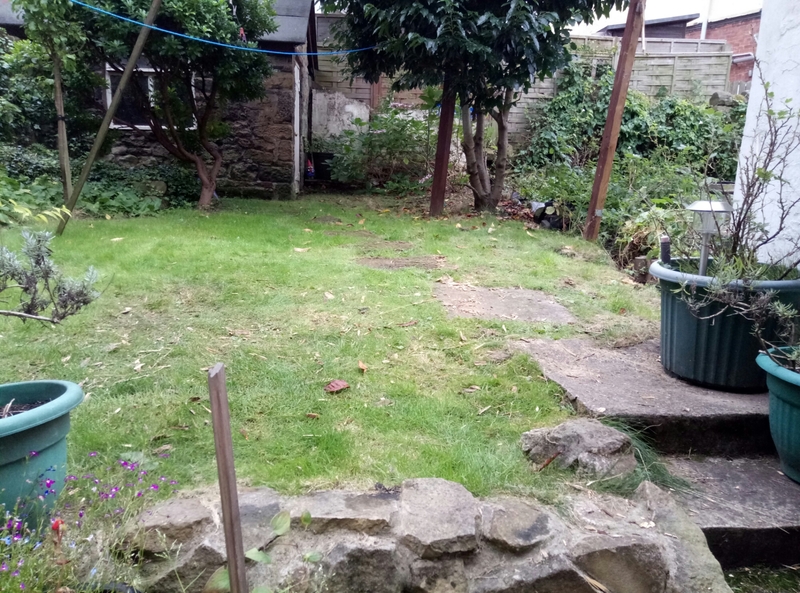 This entry was posted in Garden on 25/09/2016 by garymoore. 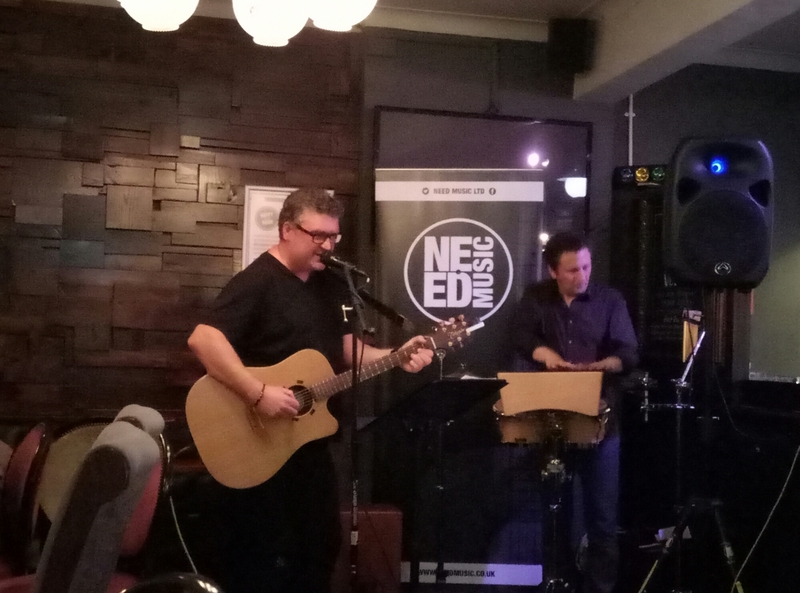 We went to see my mate, and Glastonbury companion, Karl play in town the other night. While I had work the following day, and so only had a couple of pints of (very nice) beer, I really enjoyed the evening. As did my second in command. And it was great to catch up with Karl and Michelle, another Glastonbury fellow camper. My second in command and Michelle also discussed broken legs. This entry was posted in Music, People on 24/09/2016 by garymoore. Today was spent digging concrete out of the garden. A task made more arduous by a huge tree root wrapped around one lump. However, I have successfully excavated the various layers of concrete archeology from our garden. 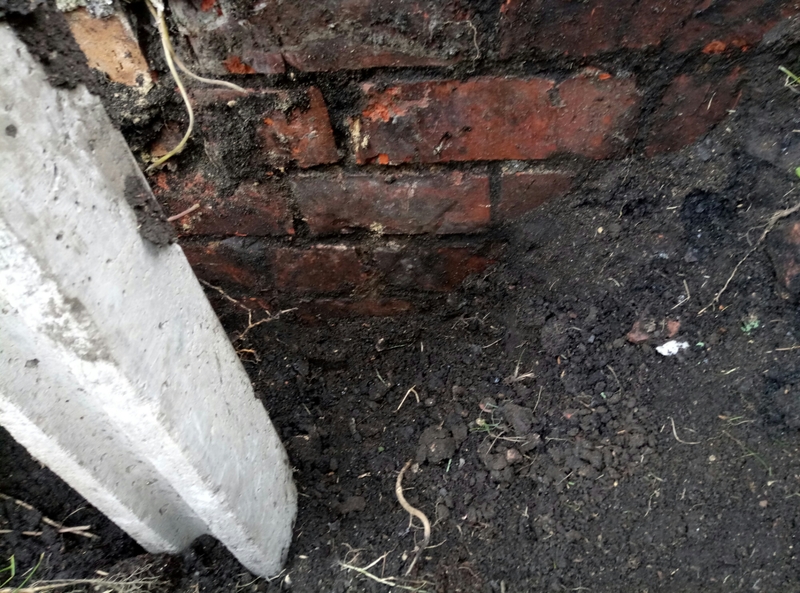 In doing so, I found the base of the old extension, demolished in the early 80s. 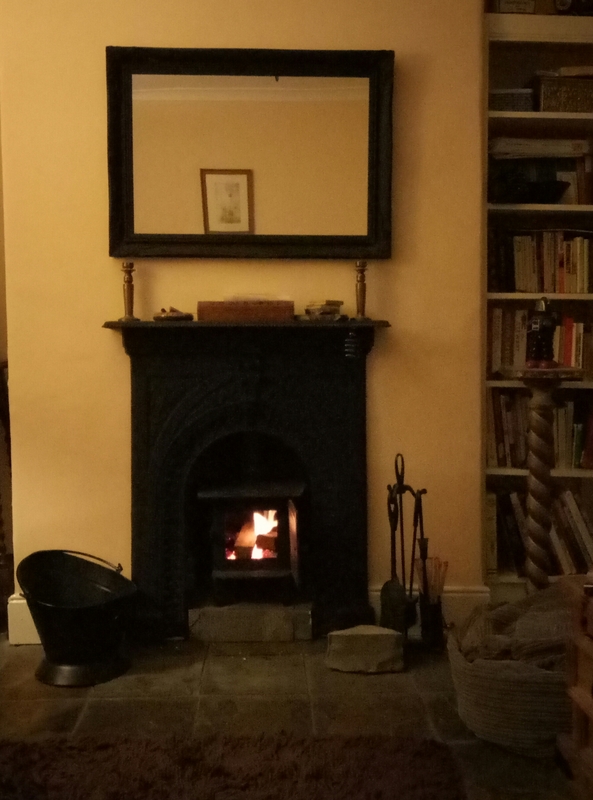 This entry was posted in Doing stuff, Garden, History, House on 24/09/2016 by garymoore. And Sundays is for gardening. Well, I’ve not actually done any gardening today, but most of my day has been spent in the garden. We now have no fence. It has, half an hour ago, been deposited at the tip. 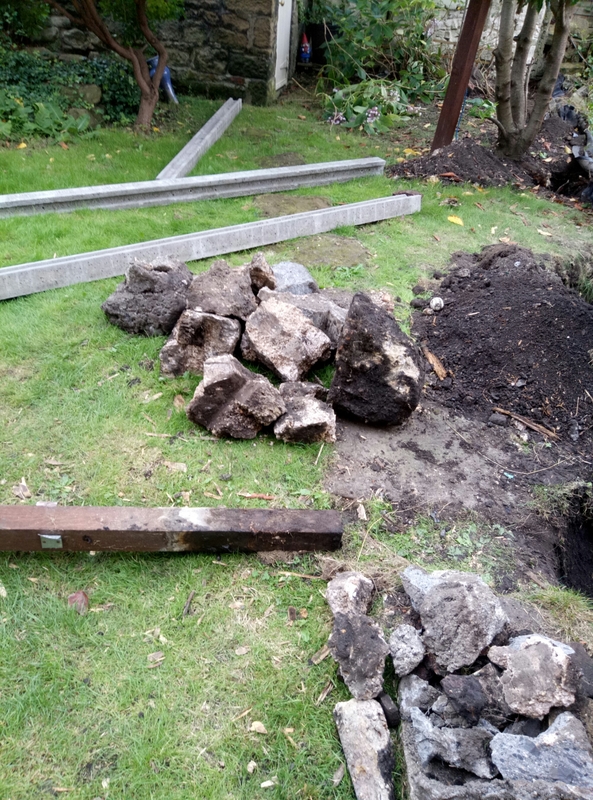 The hard part wasn’t removing the fence, it was breaking it down to fit into rubble sacks. But it has gone now and I’m left with a view of next door’s jungle and some aches. Weather permitting, next weekend will involve fence construction. I may have sprayed some weedkiller next door too. This entry was posted in Garden on 18/09/2016 by garymoore. A band called the First Edition broke up in 1975. You’ve not heard of them? They’d changed their name to Kenny Rogers and the First Edition a couple of years before. My second in command was quite taken by Mr Rogers’ performance at Glastonbury a few years Ago. So, worth listening to this. This entry was posted in Music on 17/09/2016 by garymoore. Money. We need it, all of us. But a few years ago, on 17 April 2010, someone took quite a bit of money from my house. I wasn’t aware of this until a few weeks later, though, because the money was just sitting there in its special place. And then it was gone. I did the knee jerk thing and questioned (blamed) as to whether an obvious person (no one else had been in the house at the time, or so I believed), had taken it. They hadn’t, of course. I knew that too, so I felt bad that I’d questioned their integrity. I wasn’t present at the time, but a few weeks ago I learned more about the events of the day. I won’t go into detail because. Well, because. Then, a couple of days ago, something happened that made me think about events of six and a bit years ago. All the pieces of the jigsaw slotted together and I realised what had happened. It was somewhat disturbing, but (I like to look for the positive in life) I’m glad it’s resolved. Well, resolved in that I’m pretty sure as what happened that morning. As for the money that went missing, It was in my house so I replaced it. This probably doesn’t make a lot of sense. Mostly because I don’t want to go into detail about the event or the people around at the time. Anyway, it’s in the past where it belongs. I had a nice day today. This entry was posted in Ethics, People on 17/09/2016 by garymoore. My mate Dave and I enjoyed a bit of XSLF this evening in my local. The X represents ‘ex’ as in ex Stiff Little Fingers. Two from the original band worked pretty well. A great night, with two support bands. Good stuff. I didn’t take up the option of a nightcap, although I’m now home watching Mad Max, the first one. This entry was posted in Music on 16/09/2016 by garymoore. I’ve been a (pretty inactive) member of CAMRA for a year and a half. Apart from moaning about finings in beer to a few other members, my goal of infiltrating the organisation and covertly influencing change from within remains unfulfilled. One factor behind my failure was my inability to motivate myself to begin my mission. However, the main reason was that things were already starting to change. Don’t get me wrong, most CAMRA members I’ve encountered to date have seemed to consider vegans an oddity. I’ve never declared myself to be a vegan, it’s something assumed when I’ve said that I don’t do fish in beer. They generally don’t understand that beer fined with isinglas isn’t actually suitable for vegetarians, although many vegetarians either don’t realise this or don’t care. Perhaps I shouldn’t generalise, but I can only relate my experience. Anyway, back to the point. Things were already beginning to change. Not for ethical reasons, of course, but because adding finings isn’t natural (which it isn’t). And because finings remove a lot of what makes beer taste like beer (which they do). While I’d be very happy if ethics were a driver, I’m certainly not complaining that CAMRA could be on the brink of a pretty huge change, one that could influence an industry. Guinness’ plans to revert to unfined beer by the end of the year may also contribute. There’s more about this here. This entry was posted in Beer, Ethics, Vegetarian/Vegan on 15/09/2016 by garymoore.